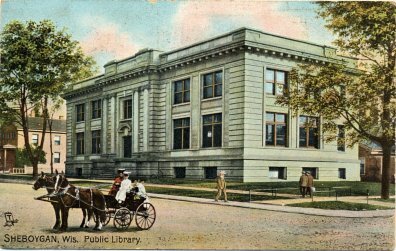 I noted in a previous post that horse and buggies add interest to postcards of library buildings. Vintage automobiles do the same thing. 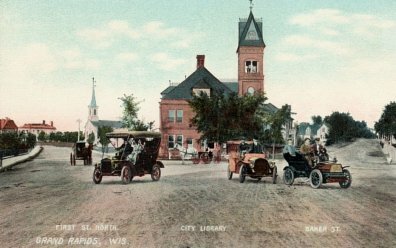 Shown below are five of my favorite library postcards with vintage automobiles. The World Library and Information Conference of the International Federation of Library Associations and Institutions (IFLA) will take place in Helsinki, Finland on August 11-17. 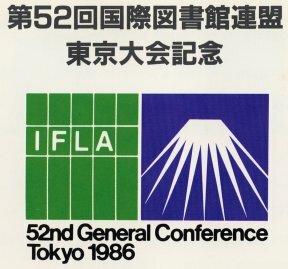 This will be the 78th IFLA General Conference and Assembly. The first such conference took place in Rome, Italy in 1928. 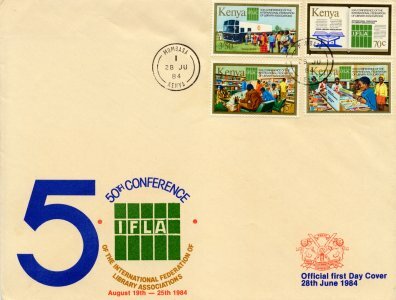 In the past, several host countries have recognized the IFLA conference with postage stamps and other postal artifacts. 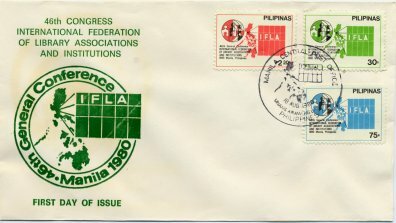 These include: Belgium in 1977 on the 50th anniversary of IFLA; the Philippines in 1980; Kenya in 1984; Japan in 1986; and more recently Vatican City in 2009 when IFLA met in Milan, Italy. 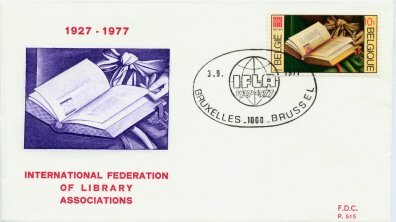 Han Krol has more about the stamps on his Dutch Librariana website (translate with Google translator). Some items from my postal librariana collection are shown below. 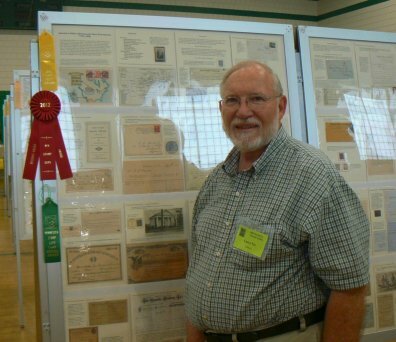 Previously I posted information about my "America's Public Libraries and Their Forerunners 1731-1956" philatelic exhibit and the awards it received at the Rocky Mountain Stamp Show in Denver in May. This past weekend the exhibit was on display at the Minnesota Stamp Expo in Minneapolis. At that show, in addition to receiving a gold medal, it received the Reserve Grand Award. That award is given to the second best multi-frame exhibit at the show. It is the highest honor that any of my philatelic exhibits has ever received. It is notable in that my exhibit is classified as a "Display" exhibit meaning that it includes non-postal as well as postal items. The highest awards for exhibits almost always go to more traditional philatelic exhibits. For instance, the Grand Award (for the best multi-frame exhibit) at the stamp show went to an exhibit titled "Sweden - The Medallion Series 1910-1919" (well deserved I might add). Although it is great to be rewarded with awards, it was also extremely satisfying to receive positive feedback from attendees at the stamp show. 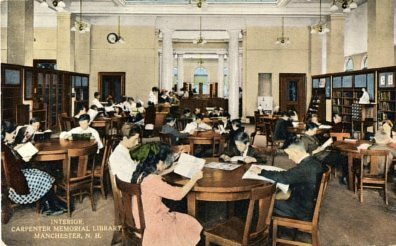 Philatelic exhibiting about the history of libraries is one way that I promote library history to a broader audience. 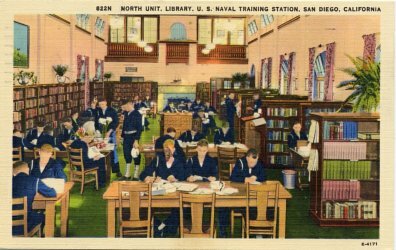 I'm always on the lookout for library postcards with interesting added features. 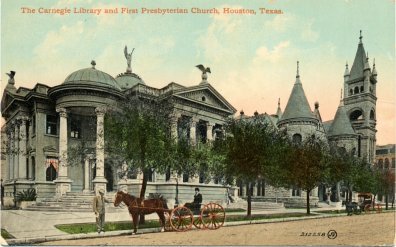 There's nothing like a horse and buggy to add a little interest to the exterior of a library building. 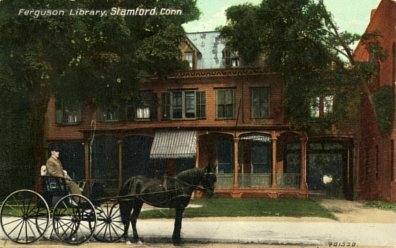 Five library postcards in my collection with horse and buggies are shown below. "It was soon after sunrise April 18, 1906, that the ground now solid underfoot began to heave, to tremble. As one journalist described the sensation of the earthquake, 'It pounced on the earth as some sidereal bulldog, with a rattle of hungry eagerness. The earth was a rat, shaken in the grinding teeth, shaken, shaken, shaken, with periods of slight weariness followed by new bursts of violent rage.' Everyone had supposed the massive construction and modest dimensions of this building would ensure its safety. As a matter of fact, the splendid masonry was stripped off that steel frame under the dome like flimsy paper from a bill-board. The walls that looked as if they might outlive Europe's cathedrals crumbled like lumps of sugar at afternoon tea." 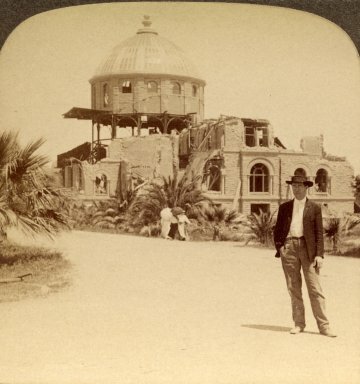 The previous quotation is from the back of a stereoview (see above) showing the destruction of the newly completed library building at Stanford University in Palo Alta, California by the 1906 San Francisco earthquake. Fortunately, the new library was not yet occupied. More about the impact of the earthquake on Stanford University including the library can be found on the University's website. 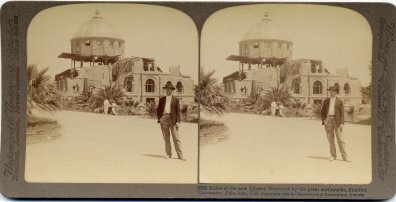 The stereoview was created by Underwood & Underwood a major publisher of stereoviews. Stereoviews are double images of a scene on a card that when viewed with a stereoscope appear to be three dimensional. 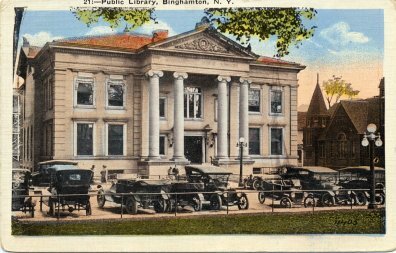 Several decades before libraries appeared on picture postcards they could be viewed on stereoviews. I only have a handful of stereoviews in my collection of librariana. 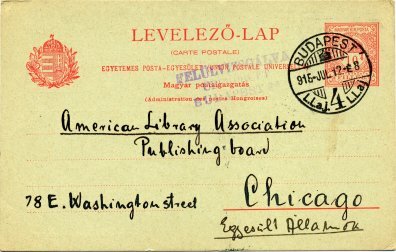 Szabo to ALA in 1915 - Where's my Booklist? Ervin Szabo (1877-1918) was Hungary's most famous librarian. Hungary has issued two postage stamps in his honor and has named one of its largest libraries for him. He was the first director of the Municipal Library in Budapest which is now the Metropolitan Ervin Szabo Library. I recently acquired a government issued postcard from Hungary that was mailed on July 12, 1915 to the Publishing Board of the American Library Association. 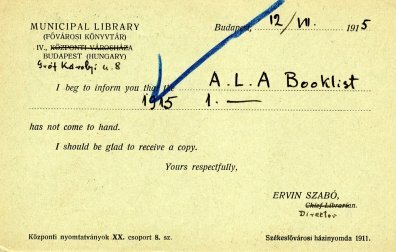 The postcard was mailed by the Budapest Municipal Library and it indicates that the A.L.A. 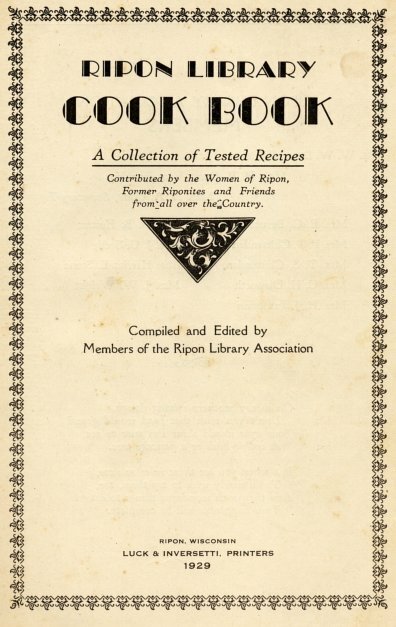 Booklist for 1915 issue 1 "has not come to hand". There is a printed signature on the card for Ervin Szabo as Director of the Library. 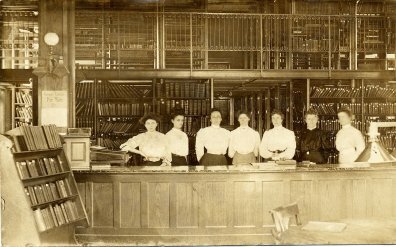 ALA began publishing Booklist, a book reviewing journal, in 1905. More about Szabo who has been described as a "socialist theoretician" can be found in the online YIVO Encyclopedia of Jews in Eastern Europe. 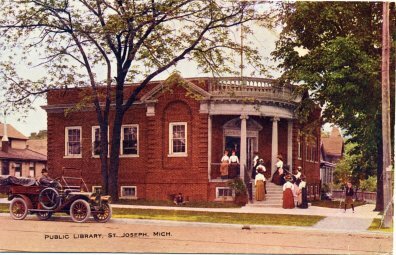 More librarians on postage stamps can be found HERE. 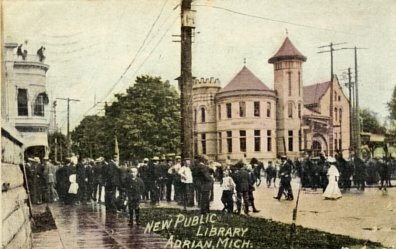 Adrian, MI received a grant from Andrew Carnegie for a public library building on Dec. 20, 1904. The initial grant was for $20,000 but was later increased to $27,500. 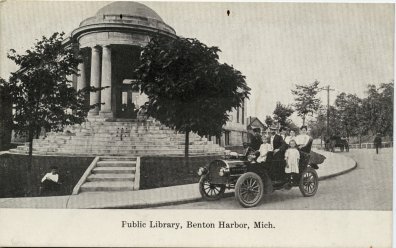 The grand opening for the new building which was an elaborate castle-like structure took place in February 1909. 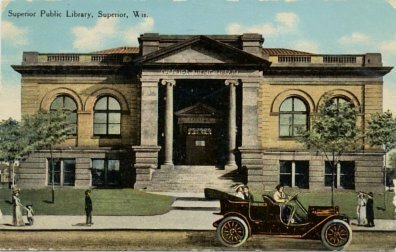 The postcard of the Carnegie building and the large crowd in front of it which is shown above is interesting in that it was mailed on July 25, 1908 several months before the building officially opened. The crowd shown on the postcard may have gathered for a parade. 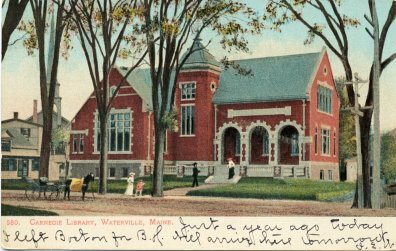 Note the two people on the top of the building on the left side of the postcard. 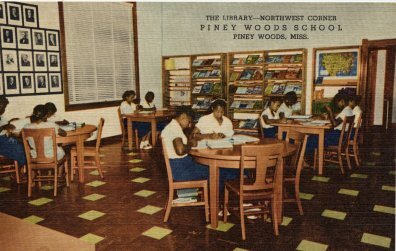 The message on the back of the postcard reads in part: "What do you think of the library? Quite a crowd downtown wasn't there?" 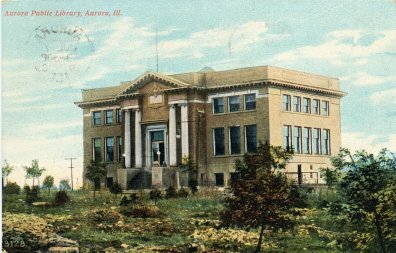 The Adrian Public Library vacated the building in 1978 and moved into a former J.C. Penny store because of space needs. Quite a change in architecture. 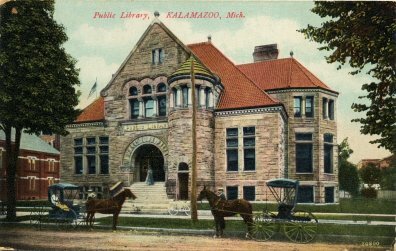 The Carnegie building is now on the National Register of Historical Places and is occupied by the Lenawee Historical Society Museum. 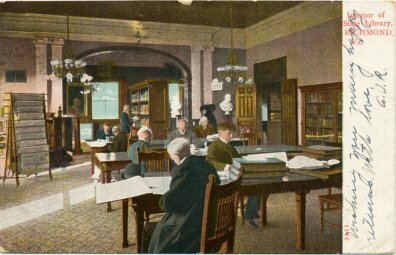 Andrew Carnegie made grants to 1412 communities in the U.S. to help fund the construction of 1679 public library buildings. 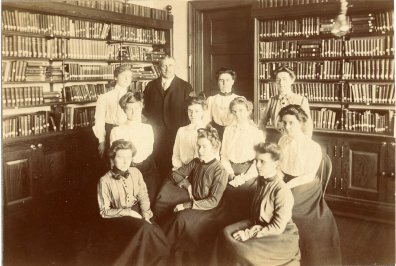 Much of the paperwork and communication regarding these grants was carried out by Carnegie's Personal Secretary James Bertram. 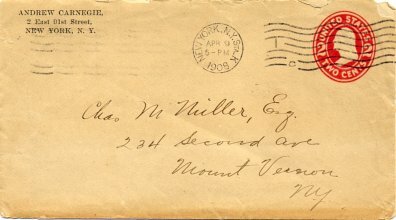 I recently acquired a letter (shown above) mailed by Bertram to Charles M. Miller in Mount Vernon, NY on April 9, 1908 in which Bertram notifies Miller of Carnegie's approval of $20,000 for the extension of the Mount Vernon library building. It is a wonderful addition to my collection of postal librariana and it will be prominently displayed in my philatelic exhibit - "America's Public Libraries and Their Forerunners 1731-1956". 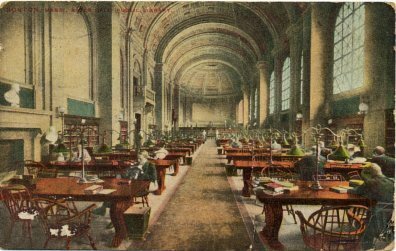 The Carnegie Corporation destroyed all of its correspondence relating to library building grants after microfilming it. 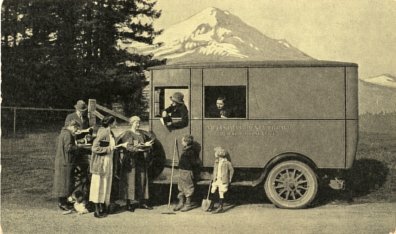 The only physical correspondence surviving is primarily located in the communities that received or requested grants if it has not been discarded as was this letter. 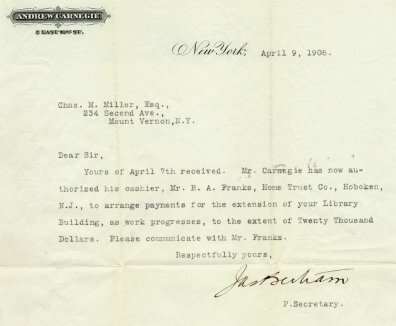 Mount Vernon received its original grant from Carnegie in 1901. In total it received $72,000 from Carnegie which is a very large grant for a single building in a community of this size. 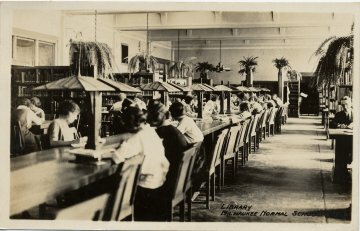 The Mount Vernon Public Library has some historic images of its building on its website.